I have made some changes to the original reposting...in my human nature, trying to improve. However, Jesus and the Bible stand firm and unchanged, the Truth of God Almighty always into eternity. Why Would Jesus Do Such a Thing? His Son, the Son of God, as He had said He was!! Again, Why would Jesus do such a thing? That question above is the most important question that exists, (it is truly second in importance since the first question of Life, your life, is: Do You Put Your Trust and Believe in Jesus Christ as your personal Lord and Savior? ), and the answer is something that every human being must know. It is simple, yet some would make you think it is complicated or even foolishness. God the Father is One part of the One God, the Triune Almighty Lord God. There is no one else before Him or after Him, (the Alpha and the Omega) who could even come close to His Love, Mercy, Glory, Longsuffering (Patience), Kindness, GRACE, and Holiness. Everything about God~~~ His character, His Names, His attributes are GOOD. He is Holy. He is just and fair. God cannot have sin. the Lord God Jehovah? No, not even the angels.). Jesus is the Perfect Lamb; He has no sin. Jesus is part of the Godhead, and He is also completely Man when He allowed Himself to come to earth in human form, a helpless little baby boy, born to a very young woman and man. 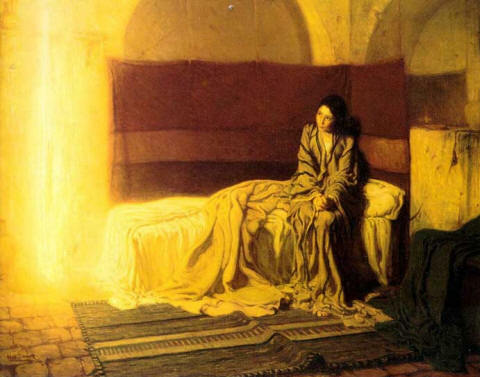 (Jesus was conceived in a young virgin, Mary, as the Holy Spirit, the third part of the Trinty, passed over her.) Joseph and Mary were visited by angels at various times to explain what was happening. Mary gave her consent to become the mother of Jesus; she, considering herself lowly, was honored to do this for her Lord~ and the Babe Who was her own Lord and Savior! In the sixth month the angel Gabriel was sent from God to a city of Galilee named Nazareth, 27 to a virgin betrothed to a man whose name was Joseph, of the house of David; and the virgin’s name was Mary. 28 And he came to her and said, “Hail, O favored one, the Lord is with you!” 29 But she was greatly troubled at the saying, and considered in her mind what sort of greeting this might be. 30 And the angel said to her, “Do not be afraid, Mary, for you have found favor with God. 31 And behold, you will conceive in your womb and bear a son, and you shall call his name Jesus. 32 He will be great, and will be called the Son of the Most High; and the Lord God will give to him the throne of his father David, 33 and he will reign over the house of Jacob for ever; and of his kingdom there will be no end.” 34 And Mary said to the angel, “How shall this be, since I have no husband?” 35 And the angel said to her, “The Holy Spirit will come upon you, and the power of the Most High will overshadow you; therefore the child to be born will be called holy, the Son of God. 36 ¶ And behold, your kinswoman Elizabeth in her old age has also conceived a son; and this is the sixth month with her who was called barren. 37 For with God nothing will be impossible.” 38 And Mary said, “Behold, I am the handmaid of the Lord; let it be to me according to your word.” And the angel departed from her. Our church Community Life Church (please do visit online and in person! Great series there at Easter and always) had a conference a few weeks ago (original posting in 2015). We were so privileged to hear two people- thank you so much, Glenn and Jordanne!- who are in the ministry and mission of Jesus Christ and our faith for disciples of Christ to pass on the Good News: Disciples Making Disciples...and so it goes. They are called "The Gathering." (See the link at this paragraph's end, please.) Glenn said that Jesus always: 1) invited, then 2) challenged the people. This invitation and challenge is still happening today! Please think about that...leave comments if you like; we can get a discussion going. I am very interested in what you think. Jordanne talked about each person or married couple invite people in their neighborhoods or circles of influence, if you will. For instance, the Christian disciple invites some folks over for a meal, perhaps, the second and fourth weeks of each month on Saturday. People can take turns on this venture, and it can be pot-luck, where each one brings a dish or tasty treat :) The people become friends, just like the Disciples did so in Bible times---people gather and have good relationships as friends, and they may discuss a topic or just talk about the week and what is going on. People get involved in each other's lives and needs, and God is apt to come into the discussion. There is nothing surreptitious about this good thing, whatsoever. The Christians are not covering up any agenda- they are opening their lives to be with other people- maybe from work, their neighborhood, as I said, school gatherings, and so forth. When we give our hearts and minds, our lives, to Jesus and try to live the very best we can and to do things that Jesus would want us to do for helping others and to spread the Gospel so that others people can join in the Kingdom of God, then Jesus is our Savior and our Lord, and when we die, we will immediately to to Heaven to be present with the Lord. Please, do not forget that Jesus also told us about Hell many, many times in the Bible- He spoke about it. We go one of two places upon death, Heaven or Hell. I so hope and pray you choose Life in Christ, Madam or Sir. How do you receive Jesus as your Lord and Savior and Have Eternal Life with Him? Dear Lord God our Father, I do believe and trust in Jesus Christ, your Son. I know that He took all the punishment that would have been due me for sins and problems that are my fault. I want to change. I want to follow You as your disciple and walk with You each day. Come, Holy Spirit, to live within me to guide, protect, and direct my life in the way only You are able. Help me do the best that I can for You, Lord. Thank You so much, In Jesus' Name, Amen, So be it. It is not how we, as people, think things should be~~~ that is established only by our Creator, Lord and Savior. We are His, God's, and God created all that is. We are not our own!! Mighty God (omnipresent, omniscient, and omnipotent), the King of kings and Lord of lords, so very much with all of His Being and His Holy Character, wants us to continue being His children by accepting the One, Pure Replacement for us and the wrongs we have done. Jesus is the Only Way. God poured out His wrath on Jesus, His Son, to pay the price that you, nor I, could never pay because we are sinful, imperfect, missing the mark- however you say that. Jesus was God's propiation for our sins, so that we could be made right with God. God is always love, but HE IS GOD, and He sets the Requirement (Jesus Christ) for our sins, not us. We are made in HIS image. God is Spirit, yet Three Persons in One God. 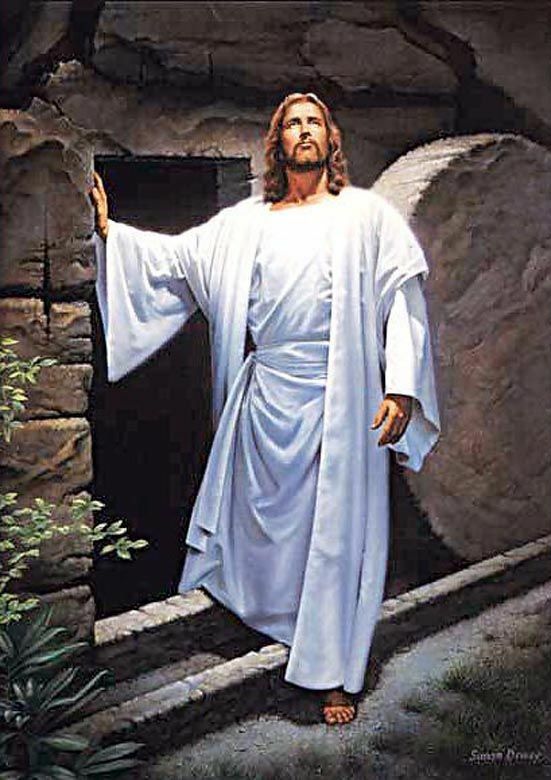 What a beautiful picture of Christ coming up from the grave, The Resurrection power of God, His stamp of approval that Jesus Christ is the Perfect Atonement for our sins. Thanks to Jeannie Smith, Reasons to Believe, with Pinterest and lostseed.com ! Lord and Savior, OUR JESUS, Has Risen! !